In part one I expressed my concern that our so-called ‘democracy’ is being undermined and began considering the nature of democracy. The original form in ancient Athens was more like direct or participatory democracy, at least for adult males. All adult male citizens could attend and vote in the assembly of the governing body. The main daily decision-making body, the Boule, was selected randomly by lot (like pulling names out of a hat), rather than by an election – which seems a good way to counter the dominance by the wealthy and powerful. The kind of democracy that developed in Western countries is often labelled ‘liberal democracy’ – a version that accepts capitalism, but also claims to be for freedom and rights of the individual, and a fair society. …health care is the right of all people. And in those countries, college education, graduate school is free. In those countries, retirement benefits, childcare are stronger than in the United States of America. And in those countries, by and large, government works for ordinary people and the middle class, rather than, as is the case right now in our country, for the billionaire class. These versions of democracy have taken something of a beating in the last few decades, as so-called ‘neoliberalism’ has risen to ascendancy. ‘Neoliberalism’ is more of a process of social and cultural dominance by the wealthy elites, than a coherent or consistent political prescription. It poses as an economic theory championing open markets, individualism, financial services, competition, rewards for those that earn them, and small government. It is portrayed as something to which there is (allegedly) no alternative (TINA). It promotes values that have deeply infiltrated culture, society and popular culture – where wealth is applauded as success, and the poor are to blame for their own misfortunes. In political practice, it’s anything that works for the powerful elites (see David Harvey on this). Wendy Brown provides an excellent account of the slippery and flexible nature of ‘neoliberalism’, and of the diverse understandings of ‘democracy’. She whittles democracy down to the most fundamental element: one that is crucial for all those who want a caring, humane society, and in which those with political power are effectively held to account. In the end it goes back to that slogan most often used to define democracy: ‘government of the people, by the people for the people’. So, it’s the PEOPLE, stupid! Brown’s latest book focusing on the way ‘neoliberalism’ has undermined democracy, has the title Undoing the Demos: Neoliberalism’s stealth revolution. Dictionaries define ‘The Demos’ as ‘the common people’ and ‘the populace’. In Salon’s interview of Brown, she defines the root of ‘democracy’ as “demos kratia” meaning “people rule”. The ancient Greek philosopher Plato was more in keeping with our current government: he reckoned governing should be done by a highly educated and knowledgeable elite who knew what was best for everyone else. According to Wendy Brown in Undoing the Demos (p.19), he defined democracy as chaos. Aristotle, on the other hand, is more like those on the 21st century left/progressive wing of politics: he defined democracy as being rule by the people, including the poor (Brown p19). 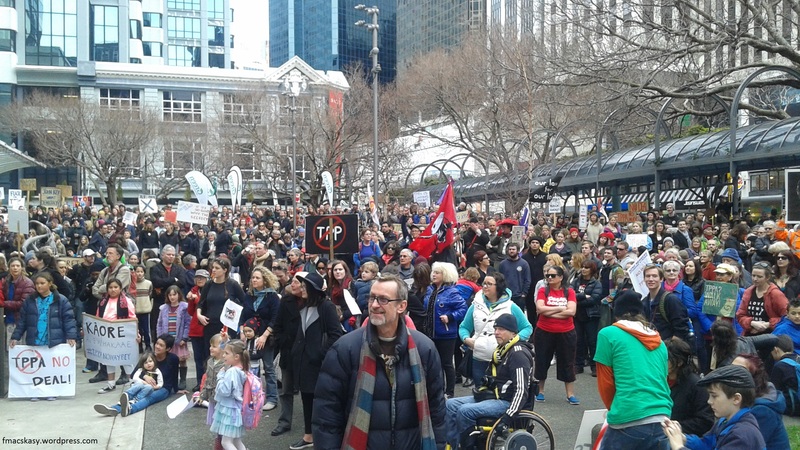 – it’s close to Aristotle’s idea of the common/poor people as seen in Micky Savage’s images of the anti-TPPA protest in Auckland last weekend, and it especially looks like this photo by Micky. It looks like this photo by Frank Macskasy. As Macskasy outlines in his report on the Wellington protest, there are major concerns that the secretly negotiated TPPA will have a negative impact on PHARMAC, meaning medicines will not be accessible for many New Zealanders. There are also concerns that multinational corporations will benefit from the agreement, while many of ‘the people’ will be likely to suffer. Tim Groser telling the protesters he (and the rest of the powerful politicians and corporations) know better than the protesting public. Trade Minister Tim Groser says yesterday’s national rallies against the Trans-Pacific Partnership negotiations will not change the Government’s approach to the international deal. Groser and Key are closer to Plato’s anti-democratic idea of rule by an (allegedly) knowledgeable elite. But the danger with such powerful elites is that they serve only in their own interest. They are likely to have limited knowledge, understanding or concern for the struggles of ordinary people, especially those with the least power, wealth or resources. As the August 19 2015 a Dominion Post editorial says, such reactions by groser and Key look like the arrogance of a government that has been in power too long. A government that is not listening to the people.